Hello and welcome to this new subforums - Music and Radio Broadcast. As you probably have seen, we've got this new radio station up for the past week. Thanks to our host, thewird, and his generosity, I was able to set the radio station up. Most of the regular members already have an idea what the radio station is about. For those who doesn't know, Initial D World Radio Broadcast is a Internet radio station that mainly broadcast Initial D and Super Eurobeat related music. We do, however, have DJs logging in and doing some song requests and shoutouts from time to time. It is pretty much like a real radio station if you ask me. This subforums is actually a one-stone-two-birds solution. Yes, this section is not just for the radio. You may also talk about music (excluding Initial D / Super Eurobeat music, please go to the Initial D Music section for that.) in general here. If you heard a song from the radio station and want to discuss about it, by all means, talk about it here with other listeners. This subsection will also have favorite DJ contest from time to time. You may also apply to be a DJ here. You agree not to open more than one connection to the radio station per computer. Freedom of speech applies to this radio station. There will be no censoring in any form or shape. If you find the streaming content to be offensive or objectionable on the radio, please close the connection and let others tune in. There are only 32 listener slots currently. To clarify further, the DJs do not necessary represent the view of the forums or IDW. If you feel insulted or offended by certain DJs, please contact them privately outside of the forums. Initial D World Radio Broadcast is NOT a part of the forums, it is a sub-entity of Initial D World - go2id.net. There will be no one-month trial or anything. This subforums stay as long as the radio station is up. 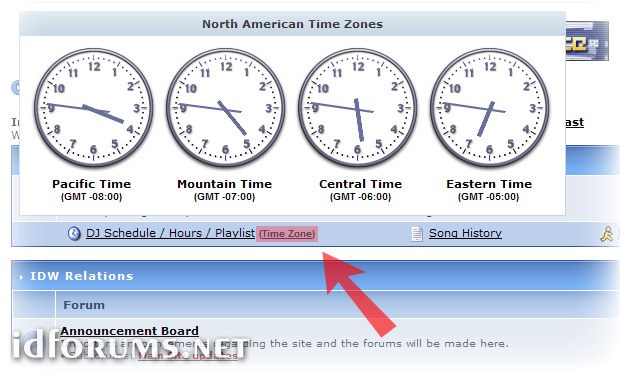 Simply point your mouse over the Time Zone link and the four major North American time zones will appear in the form of analog clock. Let me know how I can improve on that. Thanks for your feedback in advance.